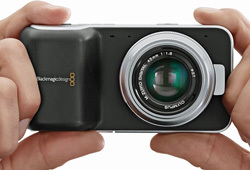 Australian company Blackmagic Design announced one of the most remarkable cameras of the year back in April in the form of its Pocket Cinema Camera, which delivers cinema-quality 1980x1080p images via a Super 16-size (12.5x7mm) sensor, and accepts Micro Four Thirds lenses. At just over $1000, the Blackmagic Design Pocket Cinema Camera smashes the barrier to entry to the world of cinema quality videography. It accepts Micro Four Thirds lenses from Olympus, Panasonic, etc. Blackmagic Design has largely sailed under the radar of the Australian photographic industry, but has been hailed worldwide for, among other things, its ground-breaking cine cameras, which cost $3000 – 4000 instead of the previous asking price for a broadcast-quality camera of around $25,000. In addition to the latest release Pocket Cinema Camera, Blackmagic offers a 4K Cinema Camera (RRP $4950) and two 2.5K versions (RRP $3250), one using M43 lenses and the other EF-mount lenses. The new Pocket Cinema Camera has miniaturised and lowered the entry-level for broadcast-quality cinematography cameras even further. It’s body-only Australian street price is just over $1000. From its Port Melbourne base it has expanded globally, with offices in the US, UK, Japan, Singapore and China, and over 300 employees, mainly in design and engineering. In addition to its range of cinema-quality cameras, Blackmagic manufactures high capacity storage devices and a range of software and hardware that supports the creation, storage and editing of digital motion picture files. Blackmagic ships around 100 products to more than 100 countries around the world, according to a 2012 Fairfax profile. While its products have had limited distribution in Australia, the new Pocket Cinema Camera is a viable addition to a photo specialist’s range, and the native compatibility with Micro Four Thirds lenses further makes it a camera to be aware of. Cameras in the Blackmagic range are available from Digital Camera Warehouse in Australia and both B&H and Adorama in the US, indicating there’s at least potential for stocking by more Australian photo specialist retailers. The outstanding feature shared by the Blackmagic cameras, beyond compact size and affordability, is their 13 stops of dynamic range, compared to a maximum of around 11 stops for the best DSLRs. This eliminates the over-contrasty look and the clipped highlights and shadows common to most video cameras, even those with HD resolution. A couple of years back Blackmagic also acquired the ‘gold standard’ of video colour correction software, DaVinci Resolve, and provides a ‘Lite’ version for post-production as part of the Pocket Cinema Camera package. A large LCD display makes focus easy, and allows playback of captured files. Blackmagic Pocket Cinema Camera includes a built-in microphone, as well as external jack-based mic/line level stereo audio connections. When reviewing recorded clips, audio can be played through the built in speaker and routed through the headphone port or micro HDMI output. The HDMI output includes all camera data such as timecode, transport control, shutter angle, colour temperature setting and ISO information overlaid in attractive anti aliased fonts. Built-in SD storage allows long duration recording with easy to use media. It can shoot in lossless compressed CinemaDNG 12 bit RAW among a range of file formats. This entry was posted in New Products, Uncategorized and tagged blackmagic design, cine by Keith Shipton. Bookmark the permalink.